On April 13, 2015, at the request of the Mendham Township Committee, the Friends of Pitney Farm presented their “Win-Win” preliminary proposal to save the most historic portion of the 5.1 acre property. The remaining acreage could be sold by the Township. This proposal honours the overwhelming support from the public to save Pitney Farm in perpetuity, the many recommendations of historic preservationists, the Township’s own Master Plan and the urging of Mendham Township’s own Historic Preservation Committee to save Pitney Farm. At the same time, the Friend’s proposal that the Township sell off a portion of Pitney Farm would help the Township’s finances and reduce current commitments to the property. Sadly, after the majority of the standing-room-only supporters of Pitney Farm left the meeting, the Mendham Township Committee disregarded public sentiment and expert recommendations. Instead, they directed Township Attorney, John Mills, to pursue public auction of the entire 5.1 acres. If you support the saving of all or a portion of the 1722 Pitney Farm, rather than its sale to a developer who will put all the historic structures at risk, pursue intensive development of the site, and build homes on the property, please send a Letter to the Editor, and also e-mail each one of the 5 Mendham Township Committee members right now. All the contact information you need to help save Pitney Farm can be found in our “Get Involved” section of this web site. All of the historic structures on Pitney Farm, dating back to pre-Revolutionary days, are in danger of being lost in developers’ pursuit of residential redevelopment, increasing Mendham’s housing density at the expense of our heritage. The Mendham Township Committee is disregarding the recommendations of its own Historic Preservation Committee. Please make your voice heard. Write a Letter to the Editor, e-mail each one of the Mendham Township Committee members. Go to the “Get Involved” section of this web site and tell the Mendham Township Committee that they cannot ignore the overwhelming public sentiment to preserve historic Pitney Farm. The Mendham Township Committee may be focused on the money, but they were elected to carry out the will of the people — and that is to save and re-purpose Pitney Farm for the benefit of the community. 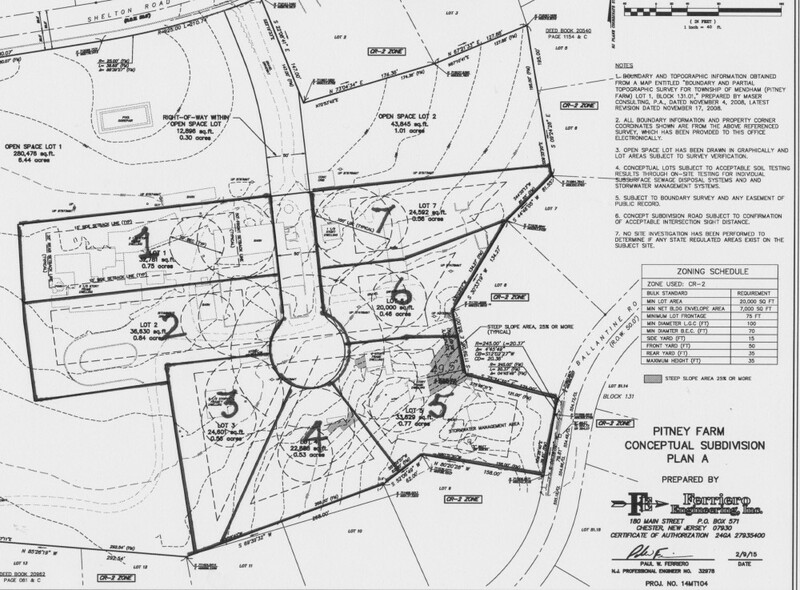 At the request of the Mendham Township Committee, the Township Engineer John Hansen presented two proposals on March 24, 2015 for the use of the historic 5.1 acres of Pitney Farm. Both plans envision the sale of the property to a developer and the loss of every historic structure. Proposal 1, shown below, would entail the creation of 7 lots, the loss of every existing historic structure and the construction of 7 residential homes. Proposal 2 would entail the loss of every existing historic structure and the construction of 5 age-restricted residences on a single lot. 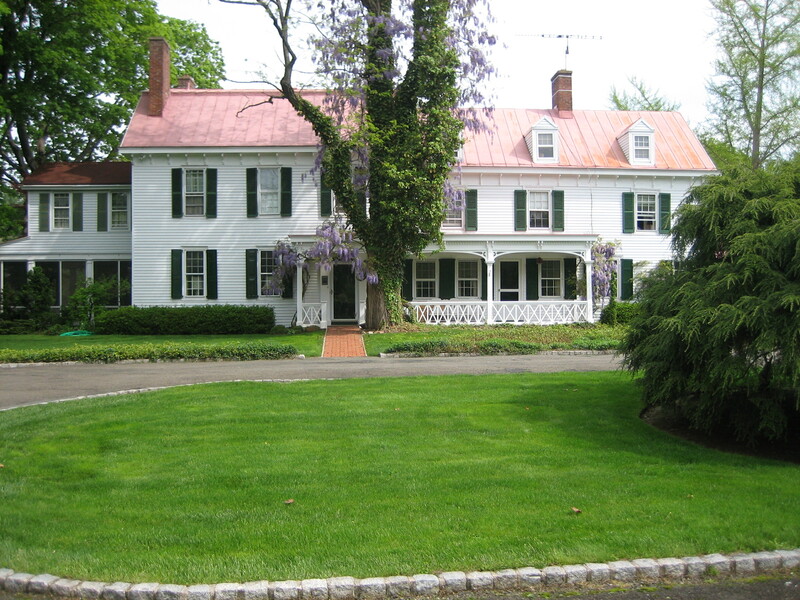 Mendham Township Engineer’s Proposal to demolish all historic structures and build 7 homes. If the thought of losing all of the recognized historic treasures on Pitney Farm upsets you, please help save Pitney Farm. Send a Letter to the Editor, e-mail each one of the Mendham Township Committee members, or go to the “Get Involved” section of this web site. The Township Committee is ignoring the overwhelming public support to save historic Pitney Farm. Tell them you want the 300-year old Pitney Farm to be preserved in perpetuity — for our children, our families, and our seniors — providing needed programming and spaces to benefit the community. Tell the Mendham Township Committee that selling to developers will lead to more intensive development of the site than the current zoning allows and therefore will increase housing density in Mendham. That’s not why residents chose to move to Mendham. Pitney Farm will be auctioned off on Wednesday, December 5th at 11:00 am. Trustee David Zimmerman Passed Away. Pitney Farm . PO Box 532. Mendham, NJ 07945 . Phone 973-906-0234 .